Lopaka Colon and Jon Yamasato, is splitting. After five years of playing together and four 1999 Hoku awards, Pure Heart is calling it quits, at least for now. Lead singer Jon Yamasato wants to concentrate on getting his college degree. Jake Shimabukuro, ukulele player, plans to open his own studio. And percussionist Lopaka Colon, who already plays with other bands, will continue to pursue his musical career. 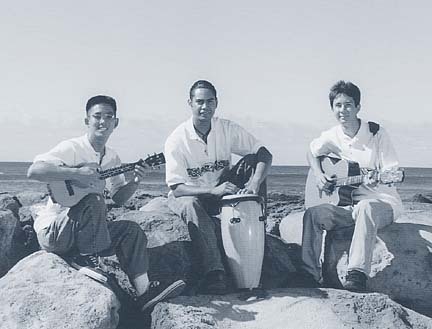 Demand after their Hoku win overwhelmed the young musicians, according to Sheldon Yamasato, band manager and father of Jake. While the break is not necessarily permanent, there are no firm plans to get the band back together. "We're leaving the window open," said Sheldon Yamasato. Pure Heart's first CD, the Hoku award winning "Pure Heart," was released in 1998. The group followed with "Pure Heart 2" and the Christmas release "2.5" this year.